Exeter Cathedral is one of the finest Gothic buildings in Europe and the worship in the Cathedral has been adorned by fine music since Medieval times. Choral Scholarships in the Cathedral Choir are available for Counter-tenors, Tenors and Basses. 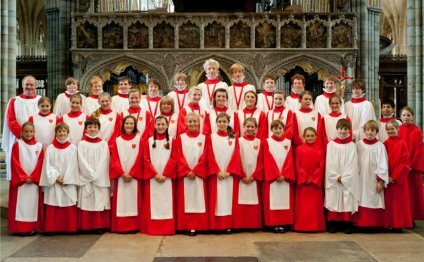 There are 6-8 choral scholars in the choir, singing with a similar number of Lay Vicars and 20 boy or girl choristers. Choral Scholarships are normally held in conjunction with degree courses at Exeter University (any subject) provided that lecture times do not clash seriously with choir commitments. The Scholarships are normally tenable for three years, though this may be extended for an extra year in certain circumstances. Scholarships are also open to postgraduates for one year or more. Each Scholarship, payable by the Dean and Chapter, is currently worth c.£3, 000 per annum and will be paid in monthly instalments. Choral Scholars are required at all statutory choral services and rehearsals when the Lay Vicars are singing.